VATICAN CITY (CNS) — Pope Benedict XVI advanced the sainthood cause of Pope Paul VI by recognizing the Italian pope as having lived the Christian virtues in a heroic way. He also recognized a miracle attributed to the intercession of an Italian martyr who, with an estimated 800 other people, died at the hands of Ottoman invaders in the 15th century, and he recognized a miracle attributed to the first blessed to be born, live and die in Colombia, Blessed Mother Laura Montoya. They now can be declared saints. The pope also formally recognized the martyrdom of 33 victims of the Spanish Civil War and advanced the causes of 18 other men and women. During a meeting Dec. 20 with Cardinal Angelo Amato, prefect of the Congregation for Saints’ Causes, the pope signed the decree approving the heroic virtues of Pope Paul VI, making him “venerable.” Before Pope Paul can be beatified, the Vatican must recognize that a miracle has occurred through his intercession. 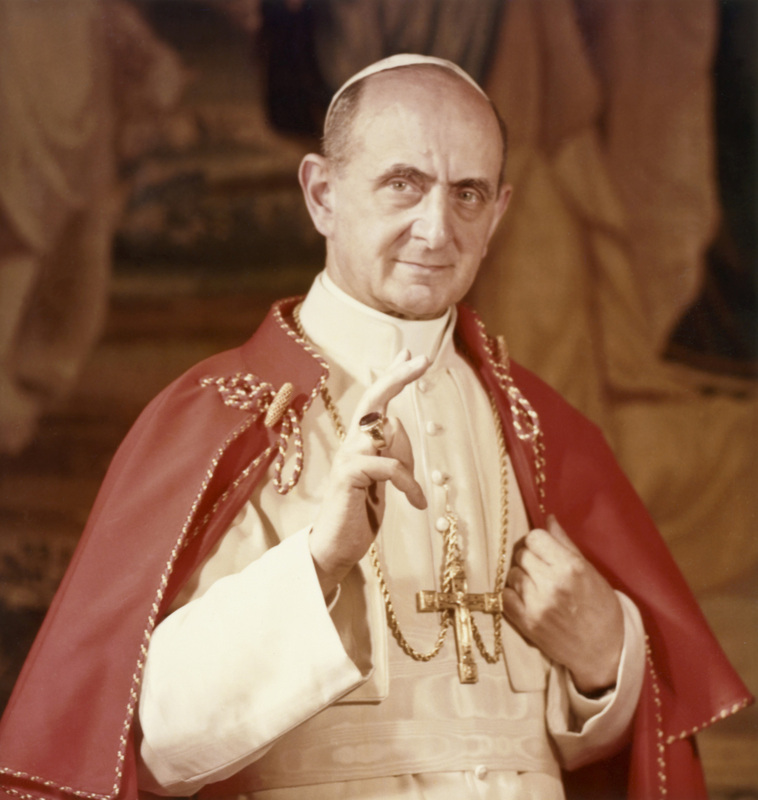 Born Giovanni Battista Montini in 1897 in the northern Italian province of Brescia, Pope Paul VI is probably best remembered for seeing the Second Vatican Council through to its end and helping implement its far-reaching reforms. He is also well remembered as the author of “Humanae Vitae,” his 1968 encyclical reaffirming church teaching that artificial birth control is intrinsically wrong, which became a focus of controversy and dissent. Amid the strains and pressures following Vatican II, he received the nickname the “Hamlet pope,” for his reportedly anguished decision-making and his evident suffering over problems of the church. However, he was also remembered as a strong leader who decisively guided the church through a time of crisis. Pope Paul was the first modern pontiff to start visiting local churches around the globe, making nine major trips abroad. Prior to his election, he spent more than 30 years helping to run the Vatican’s diplomatic machinery at the Secretariat of State, but his diplomatic skills never overshadowed his priestly love of serving those in need. He worked on behalf of prisoners and the politically persecuted during World War II, pleaded for peace to world leaders, appealed for the lives of condemned terrorists and kidnapped politicians, and donated the papal tiara to raise money for the poor. He was elected pope in 1963 and died at age 80 in 1978. The Rome Diocese officially opened his sainthood cause in 1993. — Blessed Antonio Primaldo and an estimated 800 other laymen killed by Ottoman soldiers in the southern Italian coastal town of Otranto in 1480. — Blessed Mother Laura Montoya, the first blessed to be born, live and die in Colombia. Born in 1874, she founded the Missionary Sisters of Immaculate Mary and of St. Catherine of Siena, to work among the indigenous peoples of Colombia. She died in 1949 and was beatified in 2004. — Blessed Mother Lupita Garcia Zavala, also known as Mother Maria Guadalupe, the Mexican co-founder of the Congregation of the Servants of St. Margaret Mary and the Poor. She lived from 1878 to 1963, and was beatified by Blessed John Paul II during the same 2004 Mass as Blessed Mother Laura. — He recognized the martyrdom of 33 priests, religious and a monk killed between 1936 and 1938 during the Spanish Civil War. — He recognized the martyrdom of Father Miroslav Bulesic, a Croatian priest killed by communist partisans in 1947 during the post-World War II turmoil in the region. The pope approved nine other decrees recognizing men and women for having lived the Christian virtues in a heroic way and declaring them “venerable.” Recognition of a miracle attributed to each candidate’s intercession is needed for that person’s beatification.